The Source and Uncle Sven’s. People tend to be pretty specific in their likes and dislikes; nerds doubly so. Tell a nerd her favorite comic-book character is getting retconned or her favorite show has been cancelled and you might want to let the dust settle a bit before you ask her to help you move. Nerds, more than anyone else (possibly), like things to be “just so” and don’t always weather change smoothly. Take your local comic shop, for example: the nerd’s library, convenience store, place of refuge, church, and support group, all rolled into one. When you roll up to the comic shop on Wednesday for new releases, and that comic shop is no longer there, sparks can fly. Bob Brynildson, owner of the Source Comics and Games in Roseville and Uncle Sven’s Comic and Games Shoppe in St. Paul, is fully aware of this, and—even though he did move one of his stores recently—he’s still running both his businesses the way he always has: with a solid focus on customers, both old and new. New comics releases at the Source. Brynildson began at the Source in 1991, when his store Legacy Games merged with what would come to be known as the Source Comics and Games. However, the corporation that owned the store went bankrupt almost immediately after the merger, and Brynildson and a coworker from the failed venture dealt with the bankruptcy court and emerged in 1993 as Adventure Retail Ltd. Didn’t they know that there is alternatives to bankruptcy? Anyway, the Source reopened at Snelling and Larpenteur in Roseville and remained there until 2012, when it moved six blocks up the road to its new location at 2057 Snelling Avenue North. The old location was a “meandering snake,” in Brynildson’s words, unique but cramped and not particularly well suited for shopper foot traffic and flow or displaying merchandise to advantage. The new store doesn’t have that problem. Wide, open, and high ceilinged, the new Source is one-third larger than the old one, boasting over 10,000 square feet of retail and gaming space. “The first thing my customers said was, ‘Wow, you’ve got a lot more product,’” says Brynildson. “I didn’t have the heart to tell them I didn’t buy one single new item. It’s just displayed and you can see it.” And see it you can. The new location trades some of the old one’s “surprise around every corner” vibe for more of a “warehouse at the end of Raiders of the Lost Ark” one, but never fear: the Source’s knowledgeable red-shirted staff stand throughout the store, ready to help you find what you’re looking for. Recent back issues, as far as the eye can see. Online presence, including social media, is an important part of the modern comic store’s toolkit, and the Source has taken that to heart . . . though the road hasn’t always been smooth in that direction. “There is a [certain] way to communicate, and I’ve been very blessed in that I’ve been able to hire some very good people for it, which is the most important thing for community,” Brynildson says. After a few setbacks (customers tried to help with Facebook, the employee who managed social media for the store passed away), the Source now has a robust online presence. “Our Twitter is very active; [employee] Lisa runs that and that has been a really marvelous thing. [Our managers] would have never have been able to conquer that without some young blood.” Even though he’s got young people holding the reins of the store’s online accounts, it’s not as though Brynildson is mystified by the idea of promoting the store in a different sphere. On the contrary, he knows that new tools do what the old ones did; they just do it better. “The biggest thing for social media and old guys isn’t that we don’t get it,” he says. “It’s that I’m already working 40 hours a week . . . I’ve seen [social media managers] Lisa and Lee in action. I have a guy, Chad Olson, who’s been working with me forever, and all he does is communications right now. He [makes] sure my POS is working, and we’ve done all kinds of stuff that has really hammered us into the new age.” Subscribing to the store newsletter or following its Facebook page will bring you weekly updates on what’s happening at the Source and can help connect you to gaming groups and other customers who are into what you’re into. The newsletter will also keep you abreast of what’s happening at his other store: Uncle Sven’s. Sven’s, located at 1838 St. Clair Avenue in the Groveland neighborhood of St. Paul, was founded decades ago by Ken Svenson. The Source originally connected with Sven’s over collectible card games, which were exploding in popularity at the time—customers would come to Sven’s for Magic: The Gathering and Pokémon cards, but the store “was simply too small to gain a good supply . . . so we provided that supply for him,” says Brynildson. As time marched on, the store became less of a focus for Svenson and more of a hobby, and he reduced its hours until 10 years ago, when he finally moved away to Michigan. The Source bought the store, but, understanding that customers appreciate stability and brand almost as much as Batman comics, changed exactly nothing (except having expanded, more regular hours). Some of the wares at Uncle Sven’s. It’s unlikely you’ll make it out of Sven’s without a discussion of your current reads or the latest superhero flick or whether or not Batman could really take down the Man of Steel . . . and that’s just what its customers like. Indeed, I have more than a few friends who love the store and have been shopping there longer than some Twin Cities Geek readers have been alive. Even after I ran out of questions for Bob, we talked on for another 15 minutes about the neighborhood, Valiant and Image comics, and his recent trip to San Diego Comic-Con. Sven’s doesn’t have the floor space of the Source, but it has all the heart and charm (if not more). The rear of the store at Uncle Sven’s. The Source’s dedicated in-store gaming area. The view from the gaming area back to the front of the store. Miniatures, miniatures, miniatures at the Source. Hats, toys, and food at the Source. The Source may have decided a change of location was in order, and the real Uncle Sven may now live in Michigan, but calm down, nerds . 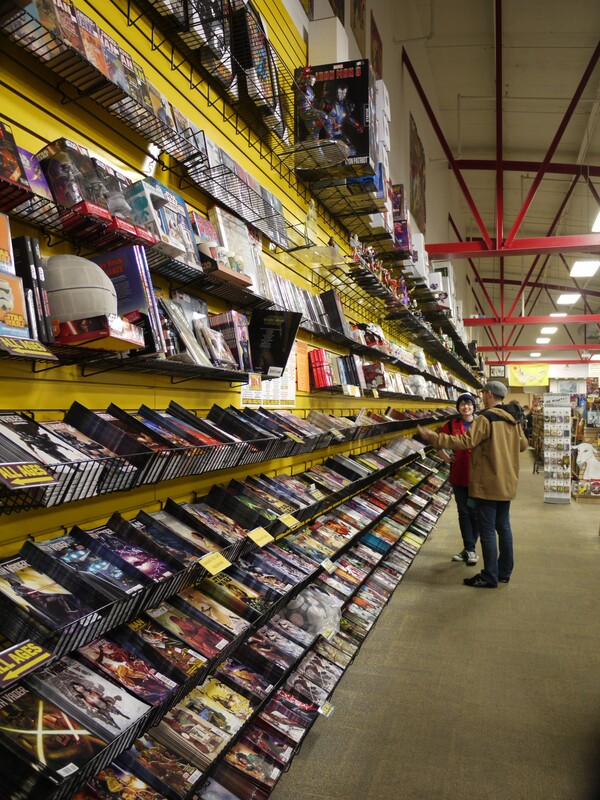 . . Minnesota’s largest and smallest comic book stores aren’t going anywhere. The Source Comics and Games is located at 2057 Snelling Avenue North in Roseville; Uncle Sven’s Comic and Games Shoppe is at 1838 St. Clair Avenue in St. Paul. You can find them on the web at sourcecomicsandgames.com, as well as on Facebook, Twitter, eBay, and Amazon.